I’ve been meaning to read a novel by Tim Winton for a long time. Dirt Music was on my list for the Eclectic Reader Challenge and I managed to pick it up at the library. This description of Dirt Music comes from Goodreads: Georgie Jutland is a mess. At 40, with her career in ruins, she finds herself stranded in White Point with a fisherman she doesn’t love and two kids whose dead mother she can never replace. Her days have fallen into domestic tedium and social isolation. Her nights are a blur of vodka and pointless loitering in cyberspace. Leached of all confidence, Georgie has lost her way; she barely recognizes herself. 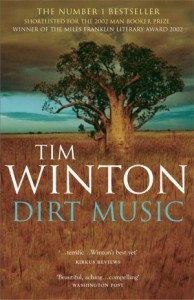 In prose as haunting and beautiful as its western setting, Dirt Music confirms Tim Winton’s status as one of the finest novelists of his generation. There are two major characters in Dirt Music: Georgie and her unlikely love interest Fox. There is a third character, Georgie’s partner Jim, who is equally important as the “antagonist” and ruler of White Point. All three are sad and sorry characters with hounded by regret and trying to set something right. Tim Winton is a master of words when it comes to description and he evokes the imagery of Western Australia beautifully. However, I don’t agree with the last statement taken from Goodreads above. While the setting is crystal clear and the motivations of the main characters are hinted at, the plot doesn’t feel as developed as it could be. There is a lot of time spent inside Georgie and Fox’s heads and neither character really makes a clear cut decision about what it is they really want. I’m sure there are people that could argue against this, but Georgie and Fox’s actions aren’t strong enough to suggest they are fully committed to the plans they think up. I admit I skipped a lot of chapters waiting for something, anything, to happen. Both Georgie and Fox spend the majority of the book reacting – badly – to the situations they find themselves in, but neither actually makes a clear decision about what it is they really want; they are both hedging their bets. Even at the end they only come together because of Jim. One good point here is that even Jim is frustrated by the two of them. The other big problem I had with Dirt Music is the complete lack of quotation marks for dialogue. There were times it became really confusing. This is the second book I’ve read without quotation marks and both were by Western Australian’s. It’s not a style I enjoy. I have rated this two stars, simply because the writing of the gorgeous WA landscape earned them.